In the pursuit of improvisation (jazz or other styles), scales are the 'palettes' utilized for creating melodies. Often, scales are only practiced ascending or descending step-wise. 'Jazz Scale Workout' by Ken Karsh contains eight measure through-composed continuous eighth note exercises (or 'workouts') utilizing 'jazz style' melodies based around the Major, Dorian (minor seventh), Mixolydian (Dominant), and Super-Locrian (Altered Dominant) scales - the most common scales in the jazz idiom. Four basic guitar fingerings for each scale are provided for the foundation of these exercises. Since these scales are the basis for improvising over the frequently utilized ii-V-I progression, the final 'workouts' found in this publication cover this area. There are two 'workouts' provided for each scale form-one with only the scale tones (labeled 'Diatonic') and the other with 'outside' chromatic tones resolving to the diatonic scale tones (labeled 'Chromatic'). The 'workouts' can and should be tried with different fingerings and should be played in all keys for maximum benefit. 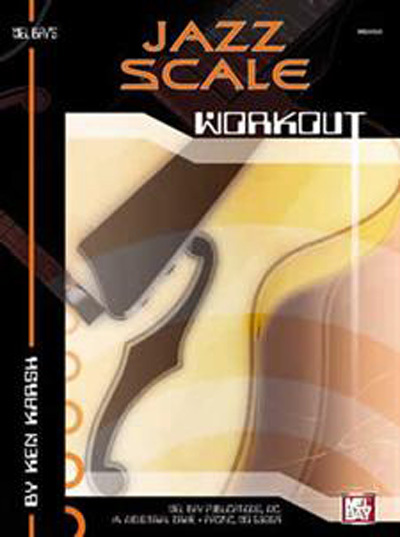 'Jazz Scale Workout' provides an enjoyable 'finger and mental fitness program' for guitarists interested in expanding their scale awareness in the jazz idiom.